If seeing is believing, then you can believe this! Please join us in welcoming Tari, the Triceratops. Fargo, ND – In case you hadn’t heard, part of Jurassic Park will soon be coming to the Fargo Red River Zoo! Because of the wide variety of extreme weather conditions in this region, the Fargo Zoo has been chosen to be the lucky home of a real live Triceratops dinosaur, whose name is Tari. Her full name is Tari Spector, which is from the re-arranging of all the letters in “Triceratops”. 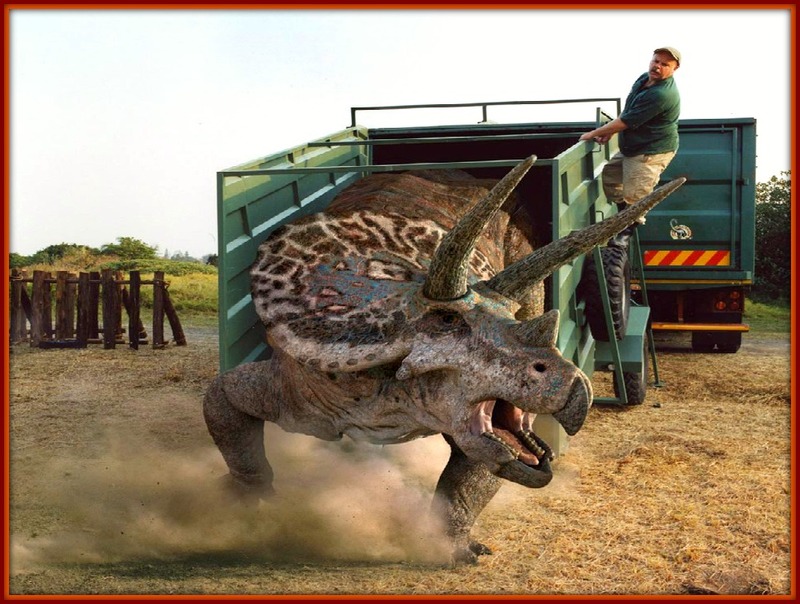 The Triceratops type of dinosaur is one of thee most loved and recognizable of all dinosaurs and was originally named by the owner of a Greek restaurant because of its three (tri), horned (cera), face (tops). Even though the Triceratops were originally believed to have become extinct about 66 million years ago, Tari is living proof that this was simply a false rumor, probably reported on some fake news websites. This cute and friendly new addition to the Red River Zoo is strictly a herbivore, and because it only eats plant vegetation, it should not be a threat to gobble up any children. Instead, people of all ages will be able to feed Tari some of her favorite grasses and herbs by purchasing them from the Dino-Food vending machine. All of the profits from this vending machine will go directly to the “Save The Dinosaurs From Global Warming” program, which was started by Algore, after he invented the Internet. Because of the unique challenges Tari brings with her, the Red River Zoo is frantically seeking to hire a few special zoo handlers for this lovable dinosaur. Past working experience with Triceratops would be a major plus for this job. If you think you have what it takes to handle Tari the Triceratops, please call the Red River Zoo to set up a formal interview.